South Africa faces the challenge of meeting the needs of its (still) growing human population, and of doing it in a sustainable way, namely without affecting the ability of future generations to meet their needs. Energy plays a central role in this challenge, both because of its significance to economic development and because of the number interfaces and impacts it has on other critical sustainability issues – such as water security, among others. In its quest for energy security, the South African government has identified unconventional gas (shale gas and coal bed methane) as a potential alternative energy resource. Coal bed methane is already being extracted in the Waterberg area of South Africa and the country is also looking to extract shale gas from the Karoo area. The development of unconventional gas, however, poses a number of new challenges to existing regulatory regimes worldwide, including South Africa. These challenges are particularly pertinent to water resources. The development of unconventional gas is (like most other fossil and some renewable energy sources) heavily dependent on water access and use. This is mainly due to the extraction method of hydraulic fracturing whereby large amounts of water is mixed with chemical additives and pumped down a horizontal well under high pressure to enable the extraction of the trapped gas. Studies indicate that the use of horizontal wells during a typical hydraulic fracturing process can require up to five times the water used by vertical wells. The withdrawal of large amounts of groundwater can lead to the depletion of aquifers, and the hydraulic fracturing fluids known as flowback water, poses risks to water quality. Issues of water security relating to water quality, quantity and availability are therefore at stake. Because of the interdependence between the energy and water sector, an increase or decrease in one sector (energy or water) will immediately affect the other. South Africa is already struggling to maintain security of both water and energy supply and hence the energy-water nexus is very much related to its goal of achieving energy and water security. A report by the World Economic Forum highlights the interrelated risks between energy and water security as a security problem. In addition other nexus frameworks include the notion of security as a normative goal complementing or even replacing the notion of sustainability. The “nexus approach” is a new way to frame the interconnected challenges in water and energy governance, including within sustainable development policy goals. What is new about the nexus approach is that it considers multiple sectors as equally important. Common features of existing energy-water nexus frameworks are interdependency between policy sectors, the need for integrated management across sectors and scales, and a focus on promoting security. While large amounts of water is needed for producing almost all varieties/types of energy – for example, cooling, storage, biofuels, hydropower – it is the process of hydraulic fracturing within unconventional gas development that poses the biggest risk to water quality in South Africa. Concomitantly large amounts of energy are needed for pumping, storing, transporting and treating (for example, desalination) of wastewater – such as wastewater created from the hydraulic fracturing process during unconventional gas development. An increase or decrease in one sector (energy or water) will immediately affect the other – if water is in short supply during droughts it may well lead to energy crises. As per the World Energy Council: “freshwater is required for each step – energy extraction and production, refining and processing, transportation and storage, and electric-power generation itself.” Without water and energy it will neither be possible to satisfy basic human needs nor achieve economic growth. Notably, energy and water security risks depend upon the balance between economic, social and environmental consequences. The cost of attaining energy and water security could be economic (eg) building new or replacing old energy and water infrastructure), social (eg closing energy and water allocations to restrict demand) or environmental (the pollution and deterioration of freshwater systems to reduce the risk of water shortage etc). While the drivers of energy and water security risk include socio-economic factors (such as population growth and economic activity) and natural phenomena (such as natural disaster, climate change impacts) it is the policies of each sector that are the biggest cause of risk. This is the result of spill over effects – for example, the creation of incentives to meet energy security objectives results in the distortion of the demand for water. Managing energy and water security risks necessitates the managing of trade-offs between separate or sector policy instruments. Uncoordinated policy aimed at security in one area may result in less security in another: for example, less water security may be at the cost of greater energy security through unconventional gas development. Law as a social regulatory instrument is used to change human behaviour – and to achieve certain outcomes. Although a number of instruments within any regulatory framework could be used to meet energy and water security target(s) it is direct regulatory instruments such as laws or regulations stipulating, for example, quality standards, bans on certain products or practices, requirements for the application of best available techniques, obligations to obtain authorisations that are representing the bulk of instruments used. The nexus between energy and water related security objectives are not routinely addressed nor fully understood. While the existence of the interdependence between energy and water is acknowledged in energy and water security terms it is not certain whether the nexus (between energy and water security) is reflected in the South African regulatory framework generally, and specifically with regard to the development of unconventional gas. Regulatory frameworks that do not reflect the nexus between energy and water security, could, instead of ensuring energy and water security, achieve the opposite, namely energy and water insecurity. This is applicable to regulatory regimes worldwide, including that of South Africa. Therefore it may be necessary to determine how other countries regulate and facilitate unconventional gas development and production within an energy and water security nexus. A focus on the environmental impact(s) that pollution and depletion of water resources from the process of hydraulic fracturing within unconventional gas development may have on energy security (being an essential element of the energy/water security nexus) may provide a reference point for a comparative study on how other countries manage the energy and water security nexus in their respective regulatory frameworks. Bierbaum and Matson “Energy in the context of sustainability” 2013 Dædalus, the Journal of the American Academy of Arts & Science 142-1. 2] Gulati “Understanding the food energy water nexus: Through the energy and water lens” WWF-SA (South Africa 2004) 14 (henceforth Gulati). Esterhuyse, Kemp and Redelinghuys “Assessing the existing knowledge base and opinions of decision makers on the regulation and monitoring of unconventional gas mining in South Africa” International Water Resources Association (2013) (henceforth Esterhuyse). Reins “The shale gas extraction process and its impacts on water resources” 2011 20(3) Review of the European Community and International Environmental Law 300 (henceforth Reins). Vairavamoorthy et al “Water and Energy in the Urban Setting” in Jägerskog et al (eds) Energy and Water: The Vital Link for a Sustainable Future (Report Nr 33 SIWI Stockholm 2014) (henceforth Vairavamoorthy). Ross and Darby “Unconventional Gas: Coal Seam Gas, Shale Gas and Tight Gas” Research Paper for Parliament of Victoria (December 2013) (henceforth Ross and Darby). Polzin “Under Pressure – How our material consumption threatens the planet’s water resources” Global 2000 (Vienna 2011). Freyman “Ceres Report Hydraulic Fracturing & Water Stress: Water Demand by the Numbers” (February 2014). Freyman, Martin and Fisher The energy-water nexus: Energy demands on water resources (2012) http://www.groundwork.org.za/ClimateHealthRoundtables/water-energy-nexus.pdf [date of use 20 October 2014]. World Energy Council 2013 World Energy Issues Monitor” 28 (henceforth World Energy Council 2013). Waughray (ed) Water Security: the water-food-energy-climate nexus (Washington 2011). Stein, Barron and Moss “Governance of the nexus: from buzz words to a strategic action perspective” Nexus Network Think Piece Series Paper 3, (Economic & Social Research Council 2014) (henceforth Stein et al). OECD Studies on Water “Water Security for Better Lives”, (2013 OECD Publishing DOI: 10.1787/9789264202405 115 (henceforth OECD 2013). Clausen et al “Energy and Water: The Vital Link for a Sustainable Future” (2014) 7 (henceforth Clausen); OECD 2013. World Energy Council 2010 “Water for Energy” (henceforth World Energy Council 2010). Grafton et al “Global Insights into Water Resources, Climate Change and Governance” 2013 (3) Nature Climate Change 315-321. In most countries, unconventional gas production (as is the case with most natural resources) is of national interest. The production of shale gas, tight gas and coal seam gas through hydraulic fracturing is considered an important source of revenue and an important element in the nation’s energy policy. The big national interests at stake with unconventional gas production put local governments under pressure. Local governments usually are concerned with protecting the local environment for the benefit of present and future generations. Often, these concerns have a legal basis, either in the constitution, in the public trust doctrine, or in domestic legislation in the field of land use and planning and/or environmental protection. In several shale gas rich countries around the world, we see attempts by local governments to challenge hydraulic fracturing (fracking) using various legal pathways. Examples are popping up everywhere, now almost on a monthly basis. In the US, in December 2013, the Pennsylvania Supreme Court declared an Act that sought to eliminate zoning authority from municipalities over shale gas extraction, unconstitutional because it infringes the municipalities’ duty under the state’s constitution (Environmental Rights Amendment), to act as a trustee of natural resources. In 2014, the shale gas richest province in the south of the Netherlands and several of the municipalities in this province, banned exploration and production of shale gas altogether, using various legal instruments in the field of environmental law and land use planning law. Although local authorities do not have competences in the field of mining law, they do have responsibilities and associated powers under planning law. Local zoning and planning is always done at the local level, and hence, municipal authorities may set restrictions or conditions to any new activity so as to fit in this activity within the existing land use. These powers can be very far-reaching, even rendering the use of a production permission entirely impossible. Should, for instance, a local zoning plan prohibit mining activities at a certain location, or prohibit the issuing of a construction license to mining constructions on that location, then no mining can take place there, even after the competent authority for the mining operations granted all necessary permits. Both in the Netherlands and the United States, however, central governments have legislated in order to have the regulatory tools to intervene in local decision-making when needed to ascertain that mining activities go ahead. In the case of shale gas, local governments and local communities increasingly pursue legal pathways to block or at least hinder shale gas operations. In the example of Pennsylvania, the state authorities used their legislative power to overrule local decision-making. Courts, however, seem to be willing to limit or even block such intervention because it infringes on the constitutional right to a clean environment and the public trust doctrine, also laid down in the constitution, according to which governments have to protect the environment for present and future generations. In the Netherlands, instruments to overrule local decision-making in the field of environmental protection and spatial planning are in place, but have not been applied yet. The debate on the constitutionality of such intervention has not arisen yet. Should intervention take place, it is likely to be argued that this is unconstitutional, not just because of the alleged infringement of the right to a healthy environment (somewhat similar to Pennsylvania, laid down in the Dutch constitution in the form of a basic duty for the government), but also because of the principle of decentralized governance that forms the basis of the Dutch public governance system. It remains to be seen whether such reasoning is going to be successful, as the Netherlands does not have constitutional courts, nor the possibility to have legislative acts of the national legislature tested against the constitution. Even without these opportunities, however, it is clear that Parliament will scrutinize any attempt by the Cabinet to overrule local rules and regulations as this will be considered to undermine future collaborations with local authorities on which the central government in almost every policy field depends for the execution of their policies. In a previous attempt in the Netherlands, to impose national decision-making upon an unwilling municipality (the selection of a location for an onshore carbon capture and storage demonstration project), huge public uprising occurred, ultimately leading to the abandonment of the project. 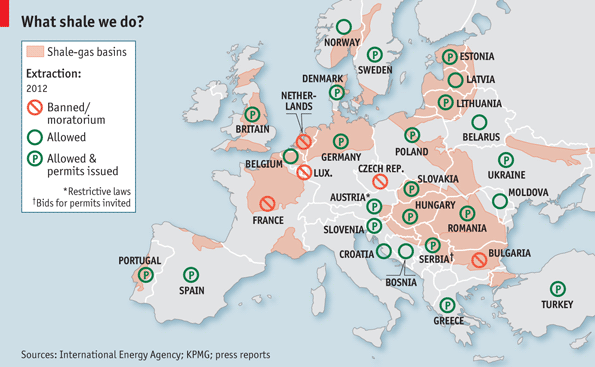 Shale gas in Europe. Image via The Economist. In Germany and France, by contrast, public protests, mainly at a local level, have strongly influenced decision-making at the national level, more or less by-passing local governments. 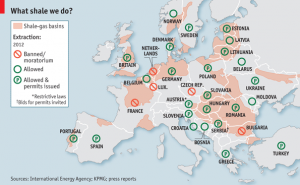 This probably is due to the fact that in these countries, local authorities have little power to stop or regulate shale gas exploration and production. Hence, protesters –with much success– aimed at national political institutions rather than at local authorities. In France, opposition was especially fierce because of the lack of public consultation. Both countries imposed a moratorium on the exploration and production of shale gas through hydrofracking with the use of chemicals. The above brief assessment of the role of local governments in the hydrofracking debate shows that the local level plays an important role indeed. Simply ignoring or legislating local governments and local communities out of the picture will be counterproductive, as the local level has legal and political cards to play out, and, constitutionally, perhaps even has to play out these legal cards to protect the environment for present and future generations. It seems, therefore, that local communities determine the success of unconventional gas development and should be taken seriously by central governments that plan to support hydrofracking. Transparency and meaningful involvement of local communities should be pursued, allowing for any kind of outcome, including the outcome of a moratorium or ban. It can be expected that at the EU level, where legislation is currently being prepared, focus will be on such important procedural issues.